So a long, long time ago in a land far, far away… actually just about 6 months ago and only 3 doors down… I put up a backsplash for my sister’s kitchen. 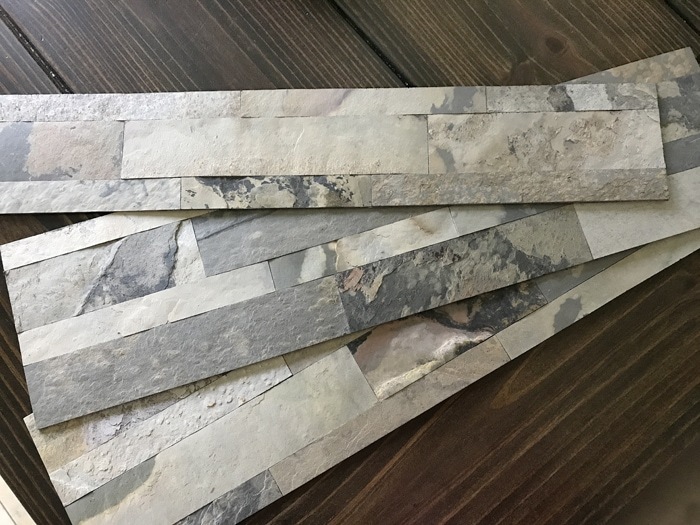 I received a free sample of Aspect Tiles from a DIY blog conference I attended last summer and being the nice sister I am, decided to donate this Faux Stone Kitchen Backsplash to my sister’s kitchen makeover. Now we’ve done faux tile backsplashes before, once in our kitchen and once in my brother’s house, but this was something fun and new. This tile is actually textured and feels like real stone on the surface… and looks amazing in person! 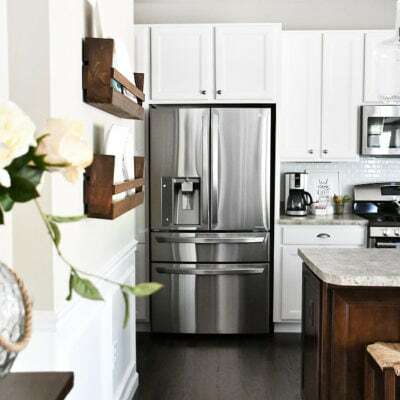 My sister has really dark wood cabinets in her kitchen and this stone tile (called Medley Slate) went perfectly with her décor. You can kind of see our progress below. Let me also note that this stuff was super easy to work with: I just measured, cut with it scissors, peeled off the back, and stuck it on the wall. 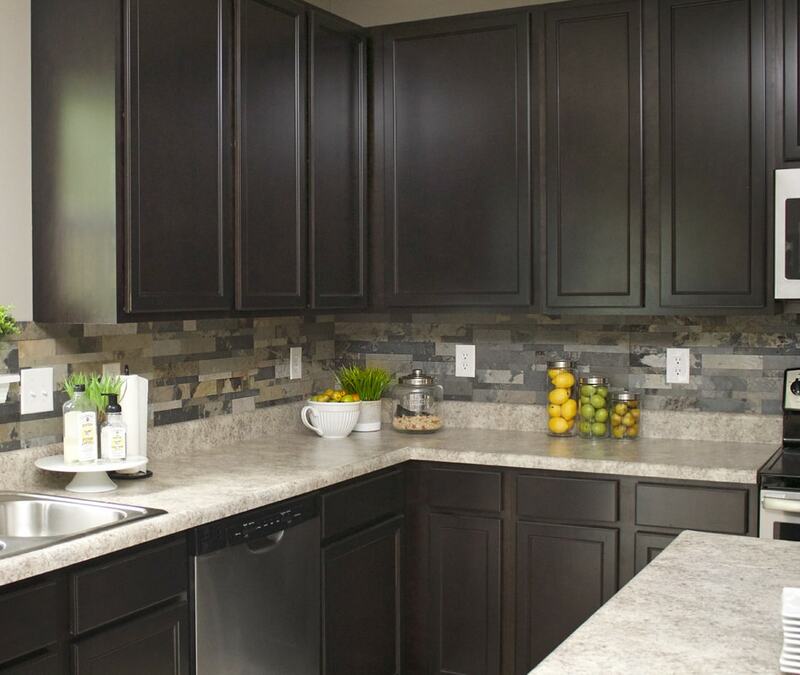 Pretty with the dark cabinets, right? 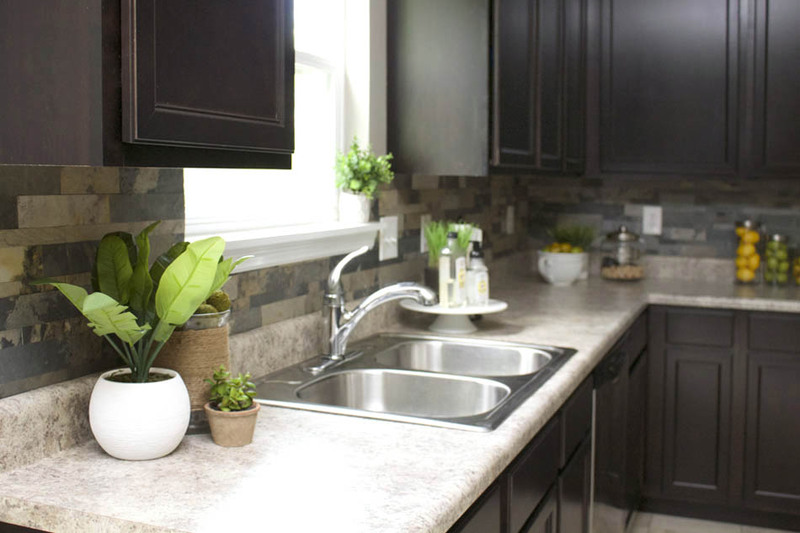 The hardest part of installing this Faux Stone Kitchen Backsplash was definitely around the window sill. For this I actually used the backing of another tile to create a template before I trimmed the tile with scissors. The rest went by easily without any major issues. 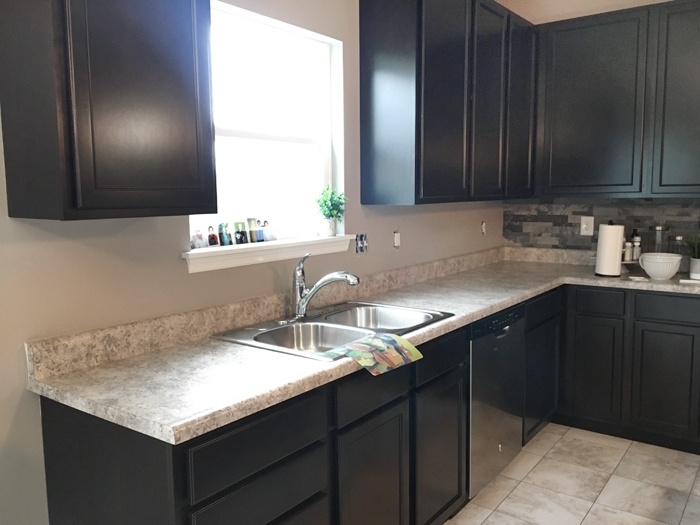 Will you please tell me what the countertops are? Laminate? and color? Thank you so much. 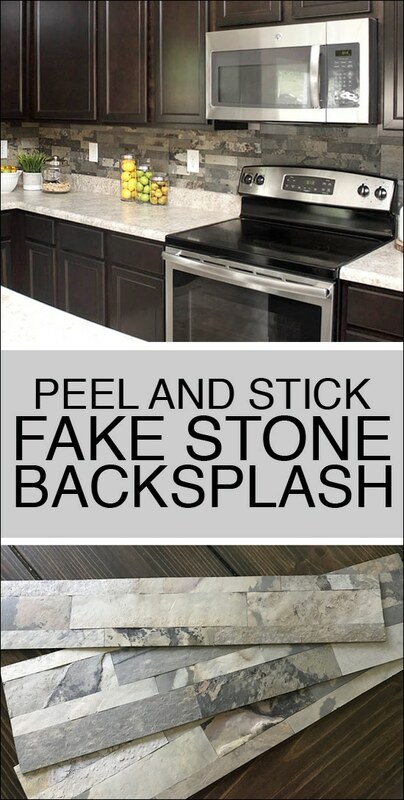 Where can I buy the peel and stick faux stone. In Nassau county or Suffolk County NY? They are laminate. Belmonte Granite by Formica! I have them in my kitchen, too. LOVE them! Erin, that is beautiful. They look exactly like real stone. I hope Ben is having a good day today. Thank you Bonnie, he’s doing great and on the road to recovery!! Looks wonderful! So happy to new blog posts! Hah, thank you! Glad to be back!! Where do I buy the ” peel and stick back splash ” I live in the middle of nowhere, don’t want to order on line. Only stores around me are Walmart, big r and Lowe’s. Will any of these places have this? I have never seen a peel and stick that gorgeous before. Thank you so much for sharing that. I am definitely going to look into it for my kitchen. You’re welcome! And I agree!!! It’s even more stunning in person, too! Could this be applied directly over top of the old laminate finish on the backsplash that is existing now? Their website says it is possible to stick on any surface! The peel and stick is very strong so I wouldn’t think you would have any problems! Stunning! My question is how did you finish the edges? Thank you! We just cut it straight with scissors. Nothing special! 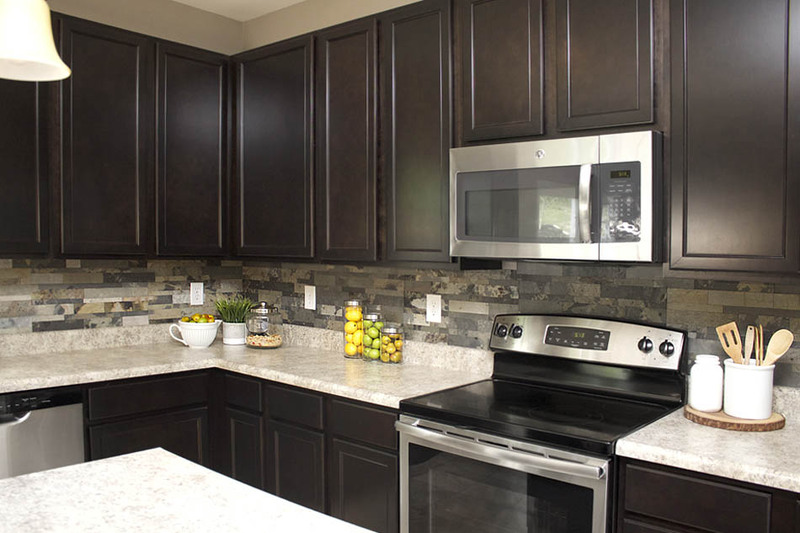 The backsplash looks amazing, and professionally done. We just bought all new appliances, and now getting ready to paint. After seeing this post. I’m now going to to this backsplash. 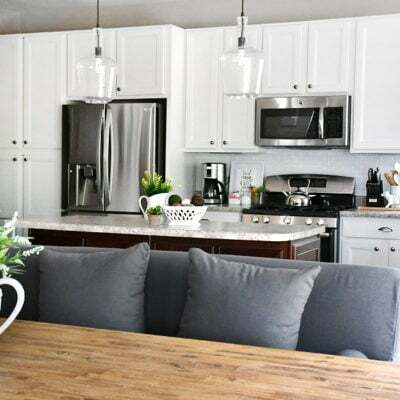 Question: would you by chance know the name and brand, of the paint color in your sisters kitchen? I LOVE that color, and would like sample it in my kitchen. 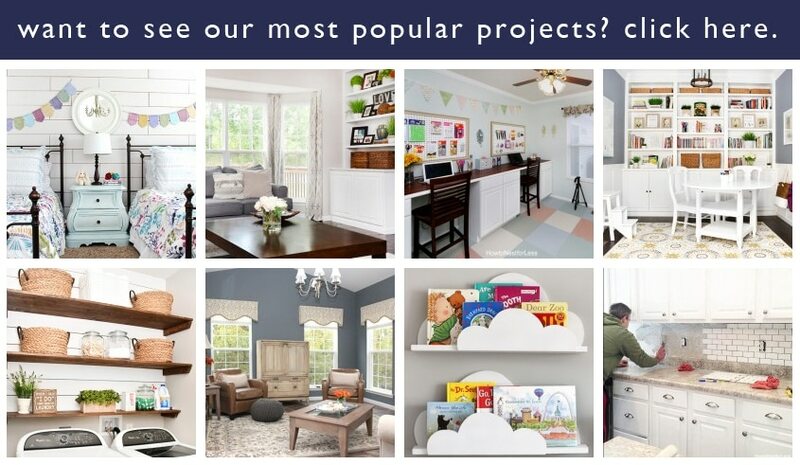 Paint color is Mega Griege by Sherwin Williams! Does the surface need to be completely flat? I’m going on top of another surface a faux brick? The adhesive on the back side of the Aspect stone tiles is engineered to stick to flat, primed, smooth walls. I would read through their installation page though and maybe shoot them an email? 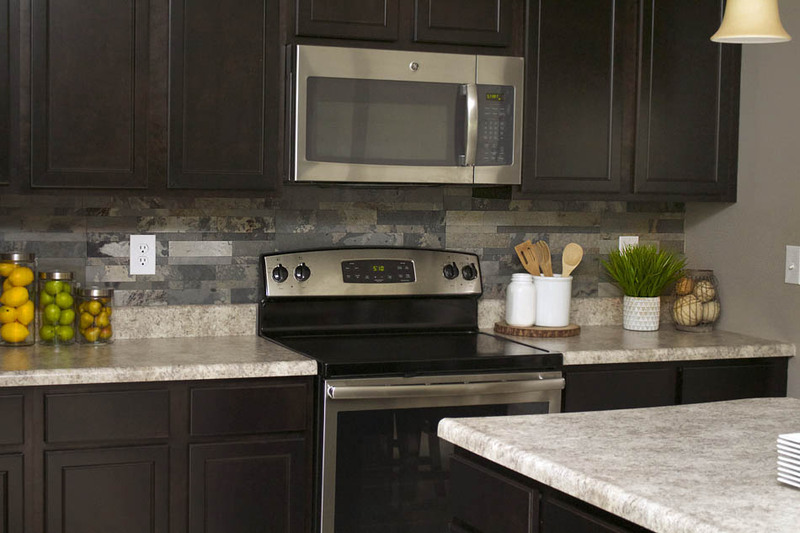 Are the faux stone panels easy to remove? I am a renter and concerned about being able to remove with little to no damage. Thanks. I would be a little worried about removing the tiles and peeling off some drywall with it. Maybe use double sided tape to attach instead? I love this look!!!! Wondering about cleaning it??? Seems to be easy so far with just wiping it down! do real tile, so I’m hoping I missed something. Wow, I think they did raise the price a bit! I did spend about $250 overall. I would say this is a great option if you can’t afford or the ability to do real tile yourself! Their website says to use soap and water for standard cleanup. 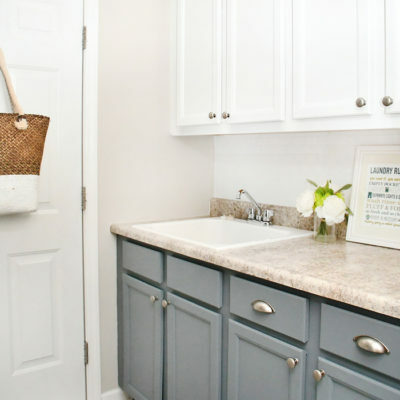 If you need a more aggressive cleaner, use a stone cleaner available at any home center. You can also seal it for an easier clean up! We used under 30 tiles, but unfortunately the price has gone up quite a bit since we first used the product. 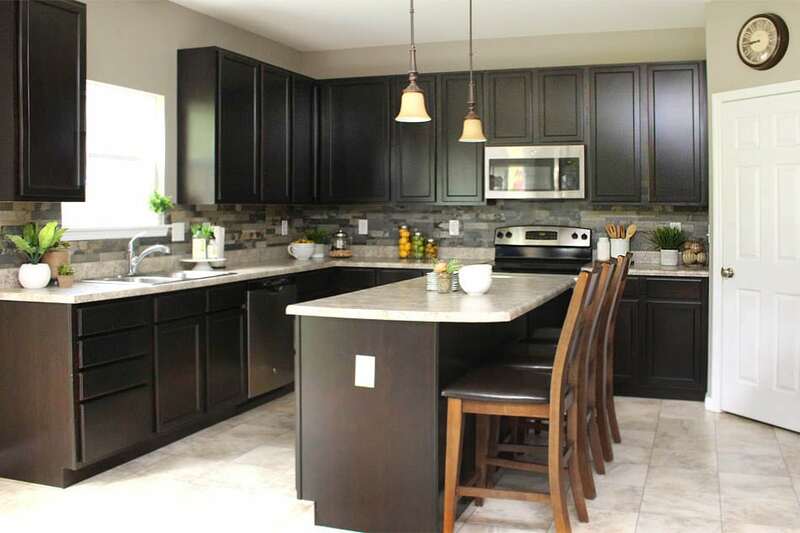 I would estimate the cost of this project now to be around $425 (but this was a large kitchen with 3 full walls of backsplash. Is the peel and stick backsplash textured or completely flat? Sorry for the late reply… It is textured! I have the same color cabinets, the same stove and microwave! So funny. Wait.. how did you cover that amount of space and only spend $150? It’s $15 per square foot! We did have $100 in free samples so the total is closer to $250 for the whole space.